Last week as I was making a mental tally of projects to start in the near future, I was certain that socks wouldn’t be anywhere on that list. It’s ironic that I’ve spent the past week knitting nothing but socks — twenty-eight socks, to be exact. Around the new year, I was tired of the self-adhesive felt disks coming off the feet of our dining room chairs. 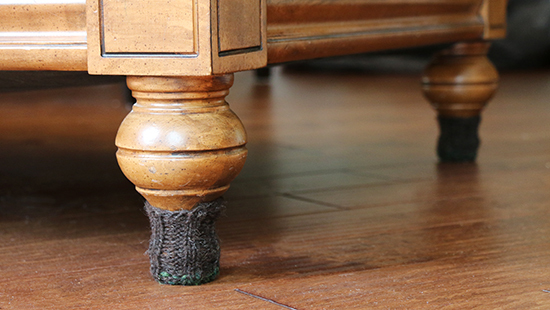 In an effort to find a better way to protect the wood floor, I made a set of chair socks for one chair as a test. Once we knew we were moving, it didn’t make sense to make them for the rest of the chairs until we knew what type of floor our new dining room would have. Spoiler alert: It’s wood. As is the living room floor. In time, we plan to put area rugs in the living room and dining room. But area rugs can be pricey; we want to be sure of room colors and furniture arrangements before we make any purchases. In the meantime, we need something to protect to floor from the feet of the pieces that don’t want to play nice with the felt pads. I’ve knit socks for six dining room chairs and a sofa, using worsted weight wool yarn on US-5 (3.75 mm) double-point needles. Each sock is a simple K2 P2 rib in the round, with enough stitches to go around the furniture’s leg and enough length to stay put, ending with a decrease row then cinching the remaining stitches. For the last few rounds of each sock, I doubled up the yarn to reinforce the bottom. I used yarn from stash remnants rather than buying more yarn, so the colors differ. I took apart the original set of chair socks and reused that yarn for the reinforcement of all of the dining room socks, regardless of sock color. I think it gives them all a consistent look, although that may be wishful thinking! With this project I was able to protect our floors without spending any extra money, while buying time before making a bigger purchase. I also used up some smaller quantities of stash yarn. It feels good when I am able to make unique items that serve such a practical purpose, but I’m still anxious to move on to the more fun projects on my list. What sort of practical projects have you made recently? These are too cute! I know they are there to protect the floor, but now I just want socks for all my furniture! Thanks! It is kind of fun to walk into the dining room and see the chairs looking so cozy.